One tenured faculty member was convicted in federal court for retaliating against a professor who accused him of sexual harassment. Another allegedly kissed and groped a student he advised, then retired in a settlement with the University. A third was stripped of his titles and grants and removed from all administrative posts. The fourth was found guilty of sexual assault. Months later, however, all four tenured faculty were still permitted access to campus—in some cases, continuing to work with students. In a year-long investigation, Spectator examined four separate, high-profile cases in which a nontenured faculty or student accused a tenured faculty of sexual misconduct, revealing violations of consensual relationship policies and instances of sexual assault. The conclusions of these cases saw faculty renounce the right to teach, be convicted of what they were accused, or felled in the court of public opinion. But these cases also revealed that in the battle between Title IX and tenure, the latter is seemingly invincible. 1. They interact with our peers. They work in our libraries. They roam freely on our campus. English professor Michael Golston was found responsible for sexually assaulting and harassing a student, according to documents from an investigation conducted by Columbia’s Office of Equal Opportunity and Affirmative Action. 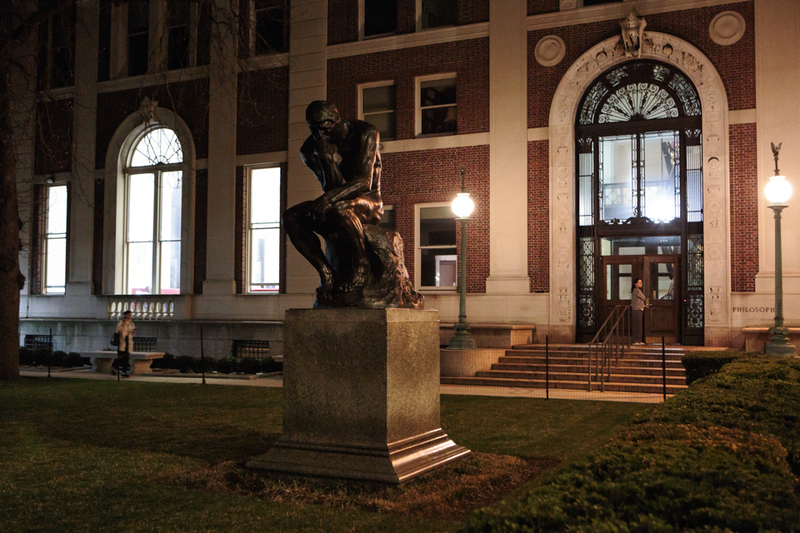 However, months later, he still retained access to campus and his Columbia-owned faculty apartment. Over a year later, the University has given no official update regarding his teaching status or access to campus to either the complainant or the chair of his department. Business school professor Geert Bekaert was convicted in federal court for retaliating against Enrichetta Ravina, former assistant professor of finance, after she reported him to the University for sexual harassment. Today, Bekaert continues to oversee research projects and teach classes on campus. According to a lawsuit filed by Jane Doe, former history and classics professor William Harris repeatedly sexually harassed her, then disparaged her to their colleagues when she refused him. Although he retired as a part of a settlement with the University nearly two years ago, Harris still frequents campus, particularly reading rooms in Butler Library where classics students perform research. He also still lives in his Columbia-owned faculty apartment. “It makes my skin crawl, and I basically can’t even bring myself to look at him or in his direction,” said one classics student on running into Harris in the library. After prominent neuroscientist and Zuckerman Mind Brain Behavior Institute Co-Director Thomas Jessell was found guilty of sexual misconduct by the University, Columbia announced he would be removed from all administrative posts. But eight months later, Jessell remained on campus, continuing to work with students and use research facilities. Columbia has never formally dismissed a tenured faculty member who has been convicted of sexual misconduct, assault, or harassment, University President Lee Bollinger told Spectator in an interview last October. 2. The process for dismissing tenured faculty is so convoluted that it’s never been used. To strip a professor of tenure, Columbia must undergo dismissal proceedings involving witnesses, submitted evidence, and multiple rounds of review by the president and board of trustees. But the adjudication process—both within the University and in court—is lengthy and potentially revealing. Instead, Columbia works with private, for-profit organizations to facilitate informal means of achieving resolution, typically in the form of mediated negotiation. Policies around tenure were formulated decades ago—prior to significant shifts in implementation and enforcement of Title IX guidelines, leading to incompatibilities. As a result, universities must devise means of intentionally skirting both federal and state judicial systems as well as internal policies to effectively take action against their own faculty. 3. The burden largely falls on complainants to avoid their alleged harassers. 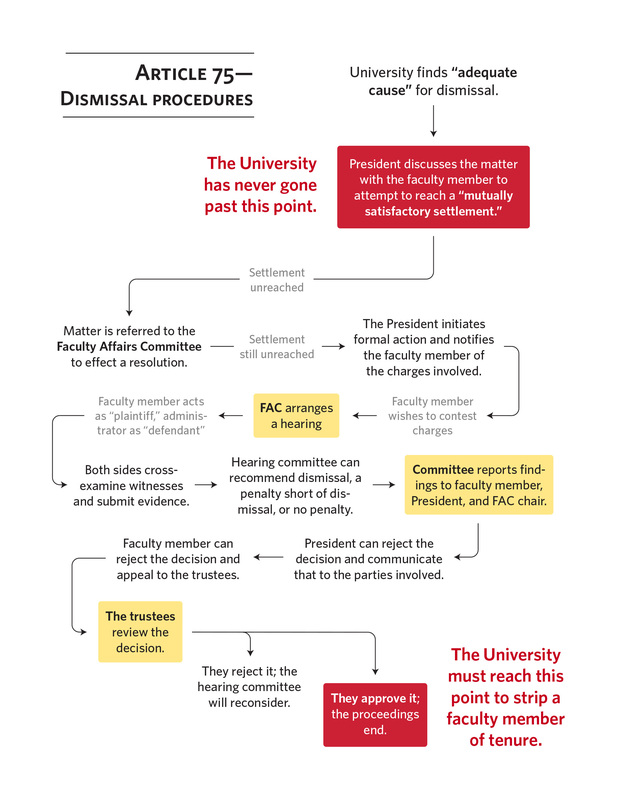 If the University were to utilize dismissal procedures for tenured faculty, it must undertake a lengthy hearing process akin to a formal court trial—involving witnesses, a faculty jury, and multiple rounds of review that include the president and board of trustees. Otherwise, Columbia cannot force a tenured professor to stop teaching, restrict their access to campus, nor revoke their housing, putting the onus on the complainant to avoid the alleged perpetrator—unless the faculty member consents to surrender rights to which they are contractually entitled. 4. Tenured professors make their own rules when settling a case with the University. When undergoing mediation processes, such as those facilitated by JAMS, tenured professors have significant room to negotiate what punitive measures will be imposed upon them by the University. Because these professors have not lost their tenure rights, any punitive measure—such as those that restrict their ability to access campus or conduct research—must be mutually agreed upon. 5. Complainants rarely find out the full scope of what happens to their alleged perpetrator—including whether or not they may remain on campus. According to Sanford Heisler Sharp lawyer Alexandra Harwin, who has been involved in a number of Title IX cases involving Columbia, the mediation process entails a form of “shuttle diplomacy” in which the adverse parties do not come together in the same room, but communicate via a mediator. Within this context, the complainant has some ground to request certain measures be taken against the faculty member, as long as it directly impacts their day-to-day operations. This may include the physical presence of the professor nearby, the level of communication that occurs between the two, and the recusal of the faculty in any educational or employment-related decisions. But most negotiations around the faculty member’s settlement occur between the University and faculty in private. In practice, this means that there is no guarantee for the complainant—even once they sign the settlement—that they will be able to know the extent to which a professor has access to campus, or whether their daily routine will be interrupted by an unexpected run-in with the perpetrator in their case. 6. When tenure rights clash with Title IX laws and policies, tenure rights largely win out. Without a concrete framework in place for adjudicating cases outside of formal dismissal proceedings, the University finds itself in a difficult bind, in which the rights guaranteed by tenure come head to head with policies dictated by Title IX laws. Even President Bollinger, in an interview in February, expressed his uncertainty over the dismissal procedures. Staff writer Shubham Saharan can be contacted at shubham.saharan@columbiaspectator.com. Follow her on Twitter at @ShubhamSahara18. Staff writer Marianna Najman-Franks can be contacted at marianna.najmanfranks@columbiaspectator.com. Follow Spectator on Twitter @ColumbiaSpec.